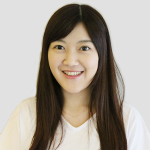 After graduating from Department of Physical Therapy, Yang-Ming University, Peggy has been practicing one-to-one physical therapy for many years. She specializes in interpreting messages from the body with her hands, as she observes the restrictions of the body and identify the specific parts of the body that require guidance and support. She would then manually adjust the joints, muscles and fascia to help the body restore its balance and alignment. Most importantly, she would add in active corrective exercises to train the body to have proper mobility and stability, which can then lead to dynamic balance between body and mind. Peggy believes that our body needs to be able to move happily and correctly with intelligence in order to achieve a good balance between body, mind, and soul. She believes that our body remembers everything that has happened to it: injuries, surgeries, daily wear-and-tear, movement patterns and so on. Such experiences then are manifested in our body and our movements. Restricted joint mobility and adhesion of the fascia may also contribute to limited movements of the tissues, while past injuries lead to deficient motor control, all of which can add up to tightness in the body, pain, and even become the cause of new injuries. Peggy’s role is to listen to the messages of the body with her own hands, provide further guidance and help the body find it’s best position. Join her on an in-depth exploration of your body and start a real conversation with it!